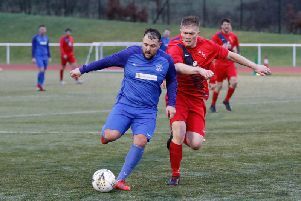 Lanark United moved eight points clear at the top of McBookie.com League Two after a dramatic 4-3 win – their 13th league victory in a row – at third placed Vale of Leven on Saturday, writes Tam Anderson. 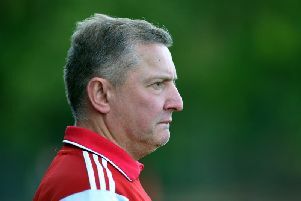 United, who came away with the three points at Millburn Park despite having two players ordered off late on, increased their points advantage over second-placed Lesmahagow whose scheduled home game against Thorniewood United was postponed. Yet Vale started well against Lanark and took the lead on nine minutes when Richard Stewart headed home a right wing corner. But United came back to equalise a minute later when Ian Watt ran through to score with a right foot shot. Both sides had further chances to score but some good saves by both goalkeepers kept the scores level at the half-time break. But it was United who took the lead on 55 minutes when Cammy Lawson fired in a tremendous free-kick from 25 yards which beat the keeper at his right hand post. Vale hit back to level on 70 minutes through Lee McGeachy before trouble erupted when Vale right back Craig Cowan was red carded for a punch on Lewis Hill. Lanark’s Hugh Kerr retaliated by pushing Cowan in the face and he too was ordered off. Vale the grabbed the lead when when Chris Jackson netted after a right wing cross from McGeachy. United hit back with an equaliser on 83 minutes when a right wing cross from Watt was headed strongly into the net by Cammy Lawson. United’s James Martin was then shown two yellow cards in quick succession and sent off the field leaving his side with nine men. But again Lanark showed their fighting spirit when a left wing corner was knocked down in the six-yard box and Hill pounced to drive the ball into the net for the winner. Lanark: Hallford, Gracie, Annetts, Haddown Lawson , O’Donnell, Martin, Hill, Watt, Kerr, Lafferty.